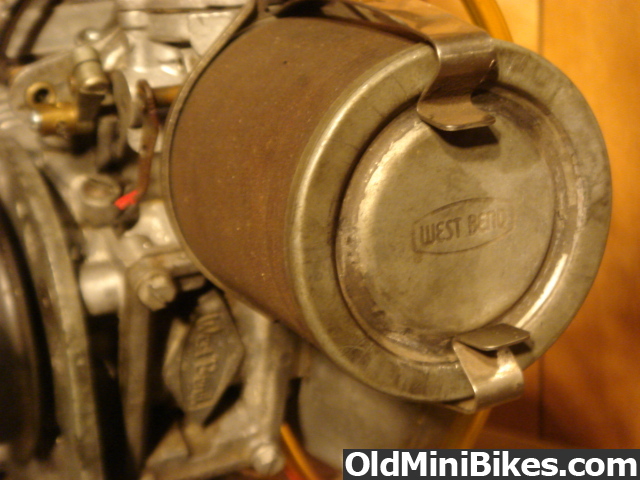 WTB west bend Air cleaner like this ONE!!!! A little help with the search. When westbend was sold to Chrysler marine gem (maker of kart accessories) had the original manufacturer that westbend used to make this air filter for the Chrysler 610/820 engines and maybe others. It was exactly the same minus the westbend logo. This would have been what the Arctic cat screamers used. The gem part number is #1200. The brown part which appears to be some kind of fiber is the actual filter. Maybe someone can reproduce them if kk knows what the brown part is made of. That's pretty neat I never saw one in the GEM box like that. The 1960's Flexo catalog describes them as a "Skinner Type" air filter. They are pretty tough to come by especially with the West Bend script cover. I bought a whole junk motor one time just to get the air filter off it. As far as what that material is I saw a hillbilly on Youtube one time messing with an old chainsaw and he said the filter looked like it was made out of tree bark! I was laughing but he's probably right. Like AJF termed it, it's some type of porous fiber material but I'm sure if it's natural or synthetic and I'll be darned if I know where to get something like that these days. I scrubbed one clean with Safety Clean solvent and blew it out with compressed air and it's hard to tell if you even got it clean or made it worse. Always blow the compressed air from the inside of the element out. It''s very dense material whatever it is . Those ribbon filters came in different lengths, what length are you looking for? I am looking for 3" or just a hair over 3" filter. Did you find your filter? Interesting I never heard them referred to as "ribbon" filters before. I've seen them called "Skinner" and the larger one a "Super Skinner" but that may have been the name of the company that manufactured them. Didn't the old glass gas filters use the same stuff? Some of those use sintered bronze or a porous stone but I did have an old AC glass bowl filter on a hot rod one time that used a similar material for the element. Yeah, since it was after all YOUR "wanted" thread!